Gail Bowen discusses The Nesting Dolls. 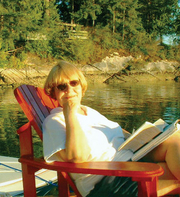 Gail Dianne Bowen, nee Bartholomew is a Canadian playwright and writer of mystery novels. Born in Toronto, Ontario, Bowen was educated at the University of Toronto, the University of Waterloo and the University of Saskatchewan. She subsequently taught English in Saskatchewan, and is currently a professor of English at First Nations University of Canada. Bowen's mystery novels feature Joanne Kilbourn, a widowed mother, political analyst and university professor who finds herself occasionally involved in criminal investigations in various parts of Saskatchewan. Many have been adapted as Canadian television movies by Shaftesbury Films. Gail Bowen's book The Thirteenth Rose was available from LibraryThing Early Reviewers. Gail Bowen's book Love You To Death was available from LibraryThing Early Reviewers. Gail Bowen is currently considered a "single author." If one or more works are by a distinct, homonymous authors, go ahead and split the author. Gail Bowen is composed of 2 names. You can examine and separate out names.